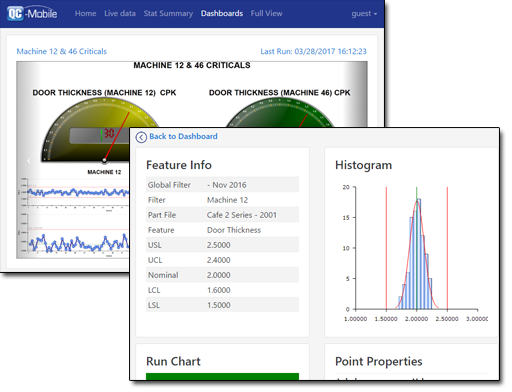 QC-Mobile features a drill down dashboard carousel that allows you to actually click the widgets in the image to find more information. This feature is ideal for overhead displays. Simply create a display user in ERS and choose a set of dashboards to view. Then launch the dashboard carousel in QC-Mobile from the PC controlling the display and the dashboards you chose will automatically slide past on a timer. As long as you continue to run them in ERS, they are automatically refreshed in QC-Mobile keeping your team apprised of the current status. See something that doesn't look right? Click or touch it to drill in and find out more about what's happening. QC-Mobile automatically figures out the data behind your dashboard widgets and presents it to you in the statistical summary report.